It's the moment of truth in your quest to destroy the Evil magic Key. Your band of adventurers faces two Wizards: an Evil Wizard who wants to use the key to unlock evil powers, and the Good Wizard who has the ability to destroy it. The problem is, the Evil Wizard has disguised himself to look exactly like the Good Wizard, so who do you give the Key to? 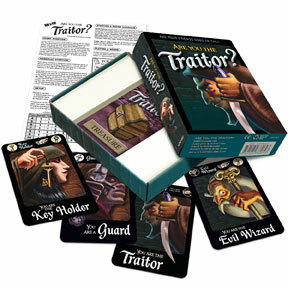 Choose quickly: one of your trusted Guards is secretly a Traitor - and next round that Traitor might be you! Everyone is dealt a card assigning them a role. You could be the Good Wizard, the Evil Wizard, the Traitor, the Key-Holder, or a Guard. The Traitor and the Guards know who the Key Holder is, but only the Wizards know which is Good and which is Evil. 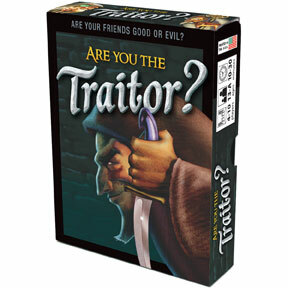 The game proceeds as an open discussion about who might be the Traitor, which Wizard is Evil, etc, until someone makes a move that ends the round. If something Good happens (such as a Guard grabbing the Traitor or the Good Wizard being given the Key) then the Good players win the round, whereas the Evil Wizard and the Traitor win if the Evil Wizard gets the Key (or the Good players make a bad call). After each round, everyone on the winning team gets a Treasure card, with values ranging from 0-5 points. As soon as someone gets 10 points, that player wins!